"There were about 40 musicians, all top session men, and lined up to do the backing vocals were Roger Cook and Roger Greenaway"
Finders Keepers began life in 1965. The nucleus of the group came from The Strangers in Dudley who had had four tracks on the Decca Records "Brum Beat" LP of 1964, including track one, side one called 'What A Way' composed by lead singer Roy "Dripper" Kent. Alan Clee (lead guitar) and Jake Elcock (bass guitar/vocal) were joined by Ralph Oakley (rhythm guitar/vocal) and Dave Williams (drums). Ralph had previously played with Dripper and Jake in The Marauders (all ex-pupils of Dudley Grammar School). 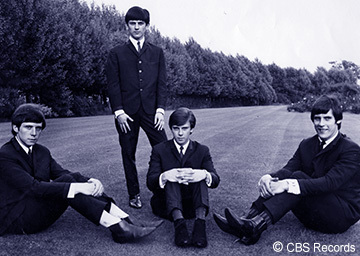 Ralph's band before Finders Keepers was The New Cyclones who also auditioned for the Decca Brum Beat album and had performed on ATV's "For Teenagers Only" TV show in 1963. Dave Williams had been a drummer in various Wolverhampton dance bands. Managed by the (in)famous Wolverhampton impresario Roger Allen, Finders Keepers were very soon working eight times a week (seven nights plus Sunday lunchtime). Ralph Oakley remembers; "The combination of Dripper, Jake and me singing harmonies together sounded much like the Hollies and made it possible for us to copy almost any popular hit easily." At first all the gigs were in the Wolverhampton, Birmingham and Black Country area, but after the first six weeks, the traveling (mainly north) became more frequent. Before the end of 1965, the group went to Germany for the first time to play The Storyville Club in Cologne. The very long hours on stage every night and the grotty living conditions were experienced by many of the West Midlands groups who toured there during the 1960s. Ralph recalls the five of them sharing a single room that was so cold "the milk bottles would freeze during the night and by morning would have pushed off their silver tops!" Suffice to say, Finders Keepers went back several times in the following years. According to Roy Kent; "The money was pretty good and we did have a laugh." "Life on the road" does not suit everyone and in early 1966, Ralph Oakley decided to leave and joined an early line-up of The Montanas (these days, Ralph is a successful published author). 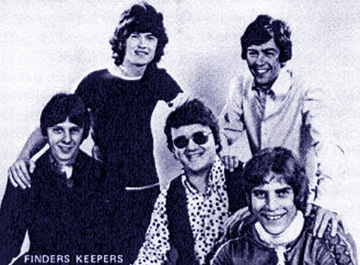 Although Finders Keepers had lost some of its vocal power, the others agreed to continue as a four-piece. "The highlight was me in a long blond wig and dress with a pillow up the front doing Marianne Faithful!" The comedy talents of front man Dripper, were now put to good use on the lucrative cabaret circuit mainly in the social/night clubs of the North-East of England. The Bailey Circuit involved "doubling" every night - social club until 10:30, night club from midnight onwards. Roy recalls; "We quickly became very popular in cabaret - especially because of our comedy routines which included 'Fatman and Throbbin', 'Hilda Baker and Cynthia', and copies of Barron Knights stuff. The highlight was probably me in a long blond wig and a dress with a pillow up the front doing Marianne Faithful!" 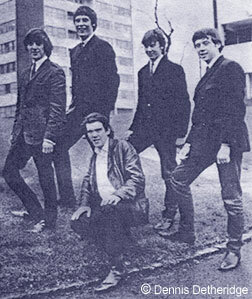 The group's popularity continued to grow and Roger Allen negotiated a deal with Maurice King in London whose company, Capable Management, handled The Walker Brothers amongst many others. In February of 1966, Finders Keepers were bottom of the bill on a package show at Dudley Hippodrome, headlined by The Walker Bros. and including The Kinks and Twinkle. Scott Walker liked the group and, as the only missing link was a hit record, he decided to produce Finders Keepers. Scott came up with a song called 'Light' written by John Stewart of 'Day Dream Believer' fame. Roy "Dripper" Kent remembers the session; "We went down to London the night before and stayed in Scott's flat. He was a really nice bloke, not a bit flash. When we got in the Decca No. 1 studio the next morning, I couldn't get my breath. There were about 40 musicians, all top session men, and lined up to do the backing vocals were Roger Cook and Roger Greenaway (David and Jonathan) who were in the charts at the time, and female singers The Breakaways who were led by Joe Brown's wife Vicki." By contrast, the B-side of the single was an old country & western song called 'Come On Now' that had been recorded by the group some 18 months earlier. Released on the CBS Records label in September 1966 and with such weight behind it, everyone expected the record to be a huge success. However, after a couple of weeks in the lower reaches of the Top 50, "Light" went out. Like many Brum groups of the time, their critically acclaimed single had bit the dust. Still, the show had to go on and despite the disappointment, Finders Keepers were making a reasonable living. Another trip to Germany, this time to Wuppertal where the band shared the stage with Bill Haley and The Comets who Dripper says "were great blokes". The year 1967 saw big changes in the Finders Keepers line-up. Jake Elcock had an offer he couldn't refuse to join local rivals The Montanas (see The Montanas) and was replaced on bass by Phil Overfield who was lead guitarist with The Staffords. Also Ian "Sludge" Lees started work as roadie. In July, the group went back to The Storyville Club in Cologne for four weeks. On arrival, Finders Keepers found that they were expected to be a five piece, so instead of being sent home, the group performed with Dripper and Sludge as lead vocalists. This format continued on return to the U.K. The additional vocal power was an advantage because Sludge had been a singer in a couple of groups in Cannock. However, having two big egos fronting the same group was never going to work and tensions developed culminating in Dripper leaving. Dripper went on to join forces with Ron Dickson and the remnants of The Vogues from Birmingham who had been struggling since the departure of Johny Carroll who became a very successful comedian. This new group was named Light Fantastic after Finders Keepers failed "hit" single and was an immediate crowd puller. "It's a Friday kind of Monday"
Sludge got two of his mates from Cannock to join Finders Keepers and so in 1967 Mel Galley and Glenn Hughes became part of the line-up. Two more singles were released, this time on the Fontana Records label. 'Friday Kind Of Monday' had good reviews but failed to chart although it has featured in later years on compilation LPs in the States. 'Sadie The Cleaning Lady' was a novelty song which had a lot of media coverage in the Birmingham area but did not sell nationally. However, the song was an enormous hit in Australia for Melbourne recording star Johnny Farnham. Glenn Hughes went on to fame and fortune with "Deep Purple" as did Mel Galley with "Whitesnake", both on the back of their time with the highly-acclaimed Wolverhampton 'super-group' Trapeze who were formed from an amalgamation of Finders Keepers and The Montanas. By this time, the drum stool in Finders Keepers was occupied by Dave Holland from pop group "Pinkerton's Assorted Colours" who after Trapeze, went on to enjoy much success when he joined the world-famous "Metal Gods" Judas Priest. There was no place for Ian "Sludge" Lees in Trapeze so he joined The Montanas for a year and recording their single 'Let's Get A Little Sentimental' before leaving to replace Dripper Kent in Light Fantastic. He later went on to a successful solo career as a comedian which included appearances on the popular children's TV show "Tiswas". Sludge passed away in July 2018 (see BrumBeat Ian Lees Tribute). Roy "Dripper" Kent retired from showbiz and had a long and successful career in education as a teacher and a school inspector. He was clever after all! 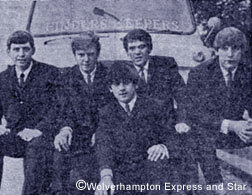 Many thanks to Roy Kent for sending this story of Finders Keepers shown exclusively on BrumBeat.net. Copyright 2007 © Roy Kent with additional contribution by Ralph Oakley.